"I can't believe it but I have bought another TR! And it's another project car, however maybe not quite as big as the TR2. This one is the ex Jim Neal TR3A TS 81592. The racing history is what 'sealed the deal' plus my son Grant was making noises about wanting to buy a TR so here we are. The car is a basket case and was looking like going down the tip but all the parts still exist so it can be restored. Geoff Byrne, Roger Gates, Andrew Gibson and Rod Chivas are 'responsible' for the purchase and have been very good in suppyling photos and back ground on the car. Any further info that anyone may have or photos would be greatly appreciated. 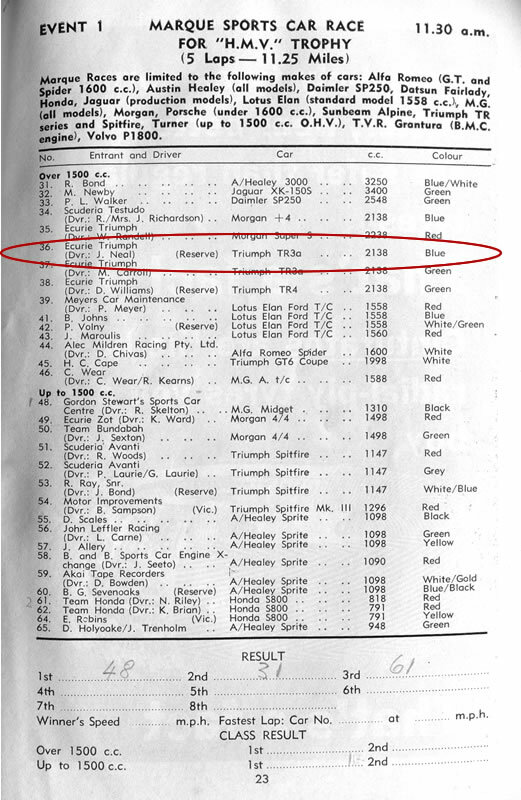 The car has spent most of it's life as a competition vehicle and we will restore it to this spec and back to the track for some historic racing. I will supply some photos for the gallery page once we collect same and eventually apply for a birth certificate. 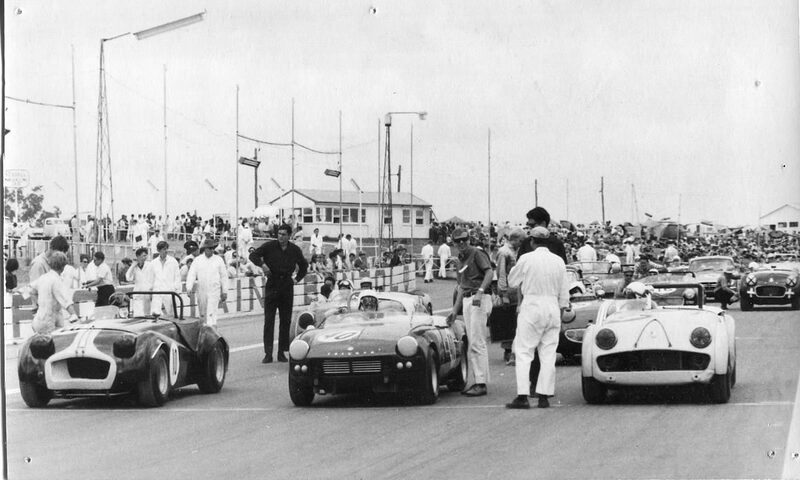 The first photo shows the car, powder blue in colour, on the front row of the grid at Oran Park in 1968- courtesy of Roger Gates. How many TRs are on the grid? Beleive it or not Rod Chivas has identified all the TRs, but where are they now? 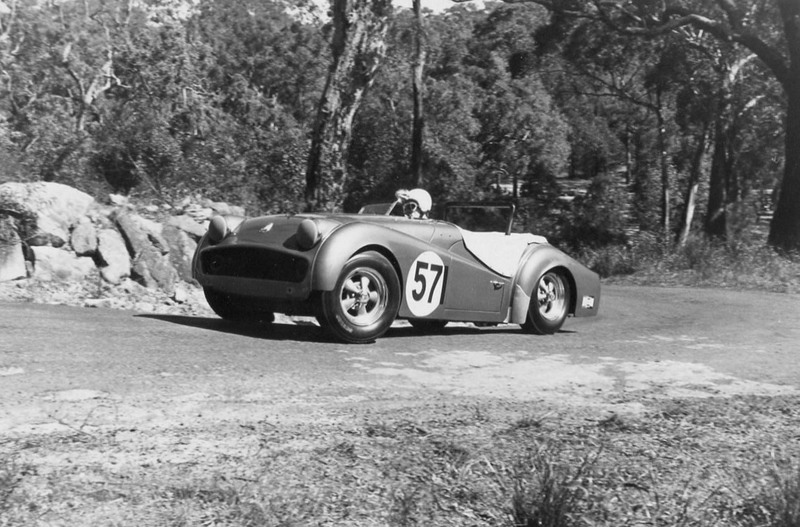 The second shows the car after it's new darker blue paint job and Crager wheels going up Amaroo hillclimb in 68/69.